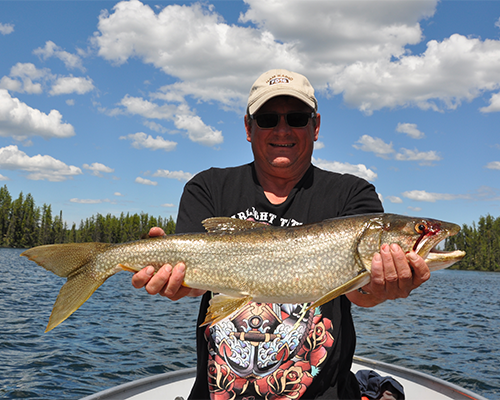 Some of the finest fishing in Canada is available at Mawdsley Lake Fishing Lodge. Fly fishing for these monsters of the deep is enjoyed by many of our guests. This largest member of the trout family moves into deeper water toward the end of our season, depending on the year, requiring the use of deep trolling or jigging techniques. 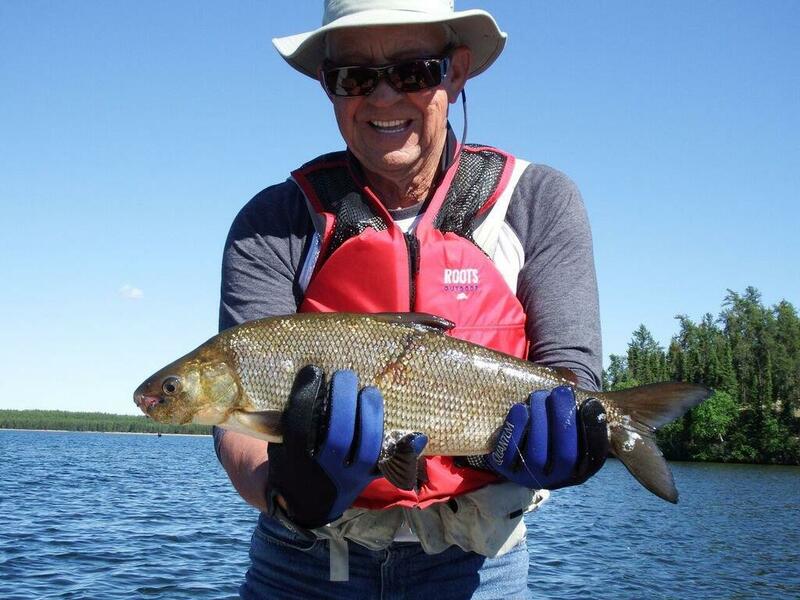 The white water of the Haultain River that feeds and exits Mawdsley and Hobson Lakes support Arctic Grayling. 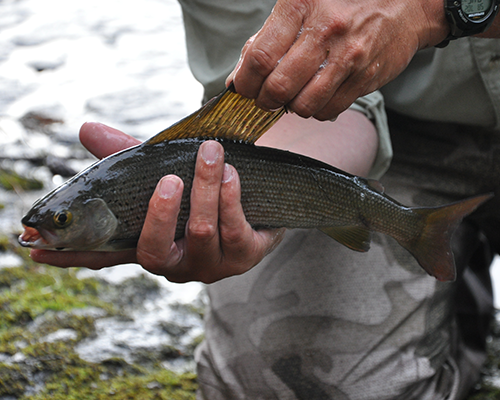 Arctic grayling is a freshwater fish in the same family as salmon, trout, and whitefish. Its distinctive characteristic is its large, sail-like dorsal fin. * Mawdsley does not have Pickerel or Walleye in its watershed. ** Mawdsley very strongly encourages guests to NOT hold large fish vertically, but rather hold fish horizontally for handling and for photographs. Unfortunately this request is not always adhered to. The four main lakes are Mawdsley, East Mawdsley, Hobson and Haresign. These Canadian Shield, glacier formed lakes cover 32 km (20 miles) of bays, islands and open water. Extensive sub surface structure provides ideal fish habitat. Many additional small lakes, short walks from the main lakes, also contain Pike. 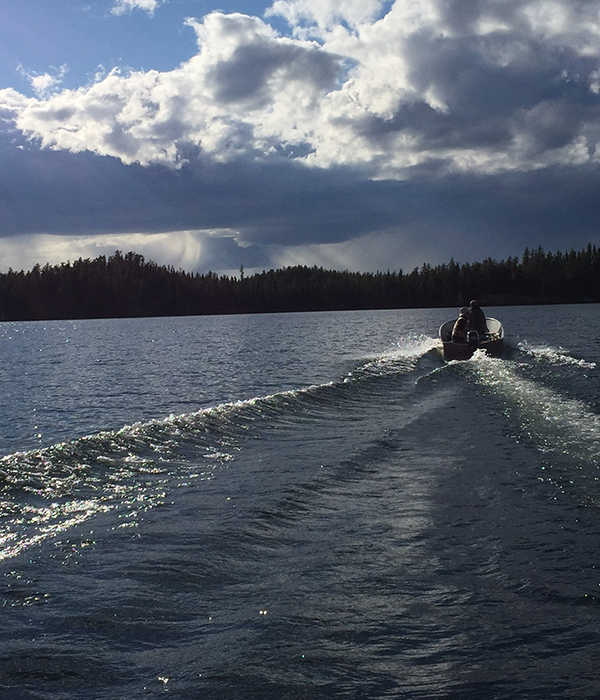 The water is very cold in early June as the ice goes out a week or two before the fishing season starts. As a result, most fish will be caught in ten to thirty feet of water. 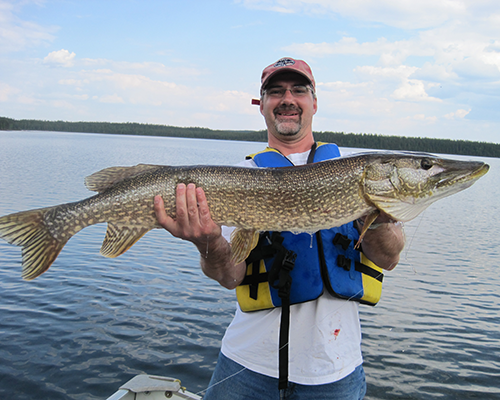 Fly fishing for large Northern Pike is very popular with our guests. Fly rods, size 8 or 9, with weight forward lines one weight heavier than the rod, are recommended to cast large flies to Pike. Heavy monofilament, or wire leaders are essential for Pike fishing. Fish caught at Mawdsley weigh up to 30 pounds for Trout and 25 pounds for Pike. Light to medium weight bait casting or spinning tackle is recommended. We suggest 10 to 12 pound test line. Lures recommended for both Pike and Trout in our lakes include the Len Thompson “Five of Diamonds” (five red diamonds on a yellow background), “Lady Bugs”(orange with black spots), “Frogs” (green with black bars) all in size 1 or 2; Rapala “Fat Raps” (silver or blue), and “Shad Raps”, as well as numerous other spoons and lures traditionally used for these species. Small black, or dark grey flies (size 18 to 22) work best for Grayling. Very small “Mepps” or “Panther Martins” can also be effective for Grayling. 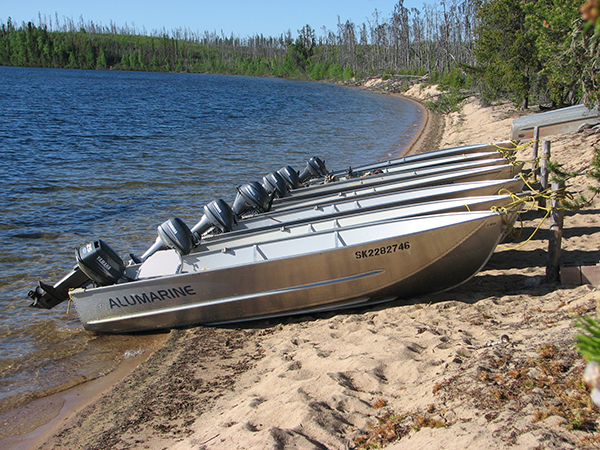 Fishing is from 14′ Alumarine boats with 15 hp Yamaha or Suzuki outboard motors, two fishermen per boat. Fishermen with children are expected to have three per boat. Boats, fuel, life jackets, seat cushions, fish cradles and nets are included in the cost. Mawdsley recommends that clients bring their own life jackets for their comfort. 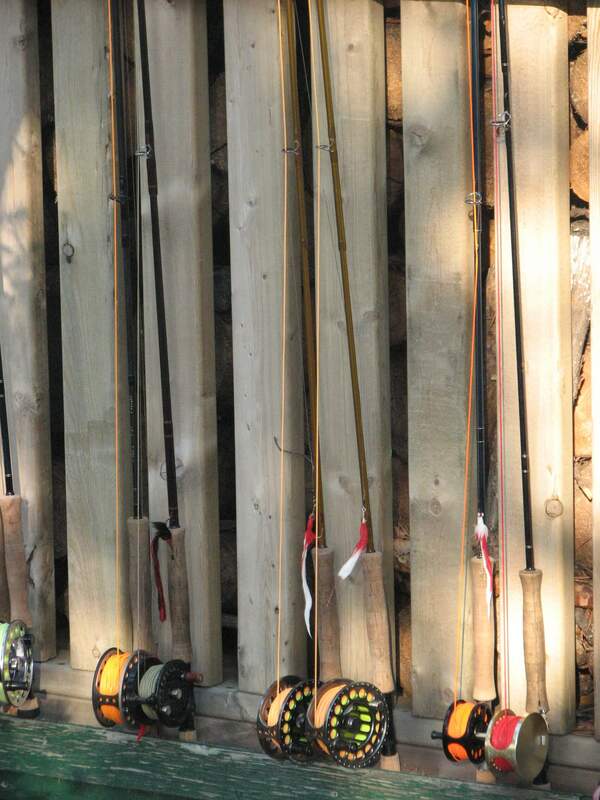 Fishermen are asked to bring hip waders to assist in short portages (rocky spots) in the streams between the lakes. 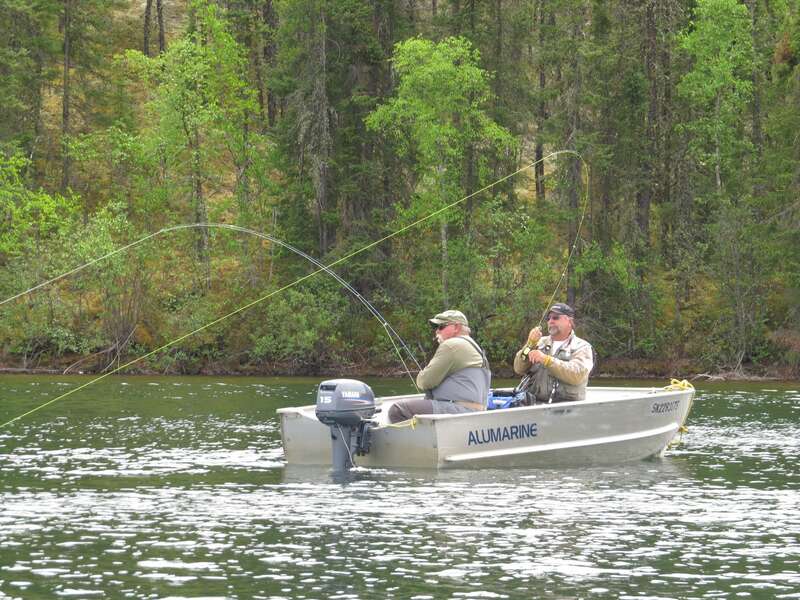 Saskatchewan fishing licenses are no longer available at the Lodge. Licenses can be ordered online through the Saskatchewan Government. Partial guide services are provided by owners of Mawdsley to new guests at no extra cost. Many of our return guests do not require guide services as they become familiar with the lakes. Safety Procedures: All guests are provided with a safety briefing prior to operation of the boats. Procedures are in place to ensure that clients get off the lakes safely after a day’s fishing. Each boat is equipped with a first aid and emergency kit as well as a spare propeller.